Seven damn years of wondering whether the woman was still alive...whether she'd spent the last two thousand five hundred fifty five days wondering if he was still alive. 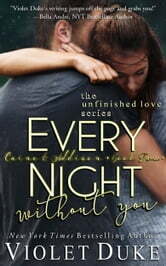 *EVERY NIGHT WITHOUT YOU (Bk 2 of 2) takes place seven years after BEFORE THAT NIGHT (Bk 1 of 2), and is the conclusion of Caine & Addison's story of love, sacrifice, and the lengths one will run―and chase―when their past threatens their future. I absolutely loved this series! I read both books in two nights. Loved it!!! Thank God we didn't have to wait seven years to find out what happened! This is a fantastic finish to a wonderful two part book. 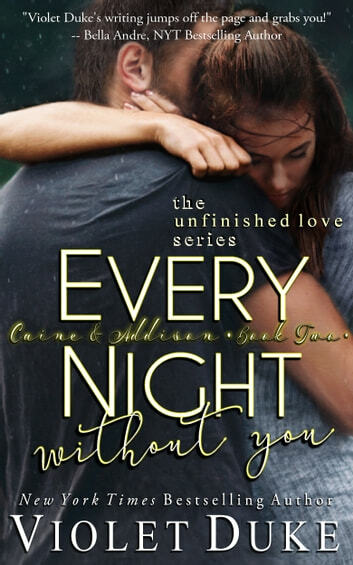 Before That Night introduced us to Caine ( a Spencer brother and seen in other Violet Duke stories, such as Love, Chocolate and Beer), and Addison, an incredibly tough 19-yearOld determined to raise her young brother and sister since her drugged up mother just wasn't capable. Throw in a crazed stalker and some noble sacrifice and you've got the makings of a wonderful love story. Violet Duke writes characters that you totally want to hang out with. Definitely one of my favorite authors. You won't regret reading this story! Honesty and Responsibility win every time! The first book was engaging. This second one was even better. Already started on Book 3. Makes one reflect on our present social sysytems. I enjoyed this duet, I loved the family interaction on both sides. Duke writes from the heart. I would recommend this book to others.